I know before I start that what I’m about to do is a mistake. Staring at my face in the mirror, I know that shaving off my beard is going decrease my subjective attractiveness and potentially lower my social capital. I know I won’t like it. I know many of my gay beardy friends won’t like it. But still I press forward and click on the buzzer. The beard is a symbol of masculinity and a signal that you’re in style and a part of a group, so what happens when I remove it? Who will I be without one? As I venture out into the world I feel a constant chill on my cheeks and every time I touch my face it feels oddly small. I don’t recognize myself in the mirror. The man looking back at me is too young and his chin is too narrow. I feel less confident and less connected to the men around me. Entering into the boisterous Gym bar on 8th Ave a fabulous queen grabs my arm and shouts, “Watch yourself honey, you just walked into a viking party! Better stick close to us or they’ll eat you alive.” Excuse me? I think to myself. Are you talking to me?? Now, I’ve never thought of myself as a bear and I know I’m not as big and wild as some other men, but before shaving off my beard I would have been at least been considered a wolf and I was the one doing the eating. Has shaving really impacted my place in the gay social order that much? I feel like a shorn Sampson diminished without his superhuman strength. 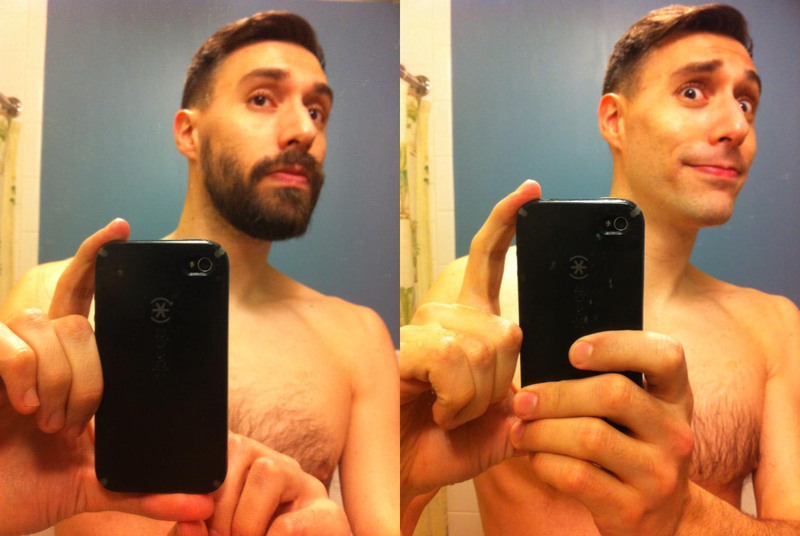 “Don’t shave your beard–you’ll be invisible!” was the advice from a gay friend the day before I went smooth-cheeked. His words were echoed a dozen times by others and I acknowledge each one with the sentiment: to truly own something, you first must lose it…and then seek to regain it. And here is the root of why my beard is so important to me: Not because it’s in vogue and let’s me feel like part of larger group, but because it is a physical symbol of the journey I’ve been on for the past few years. When I moved to NYC I was a young man on a quest to better understand myself and the gay world. I’ve learned and grown a lot since then and along the way I grew my beard and it made me feel more like a man. My beard progressively grew longer through dating and breakups and finally meeting a man I want to call partner; it was with me when I started feeling more like a professional with career goals instead of just a guy at a computer; my beard has been my companion through many adventures where I’ve learned about loss and friendship and what it is I truly want out of life. So I’m growing my beard back and will wear it proudly…knowing now it’s truly mine to enjoy and revel in. The Wolf is back and you’re gonna be in trouble. This entry was posted in Observations/Lessons, Personal and tagged beard, gay community, NYC. Bookmark the permalink. I will always know you for your beardless and handsome face, friend! You are a wolf with our without it! *blubbering through happy tears* Oh you are just too sweet, Katie. I’m so late in reading this post! But the majority of years I’ve known you have been clean-shaven. Beard or no beard, you’re still just Shaddix to me and I love you!